As part of the Be The Change movement created by the BlogPaws community earlier this year, we learned that just one act, one tweet, one person can make a difference for the anipals who need it most. And now, as we get ready today to head to BlogPaws West in Denver, CO, Pedigree is announcing a special program, where just one blog post will make a difference. For each blogger who posts about the PEDIGREE® Adoption Drive, through September 19th, Pedigree will donate a 20-pound bag of its new Healthy Longevity Food for Dogs to shelters nationwide. It's simple. Write a post, help a dog. And you don't have to be a BlogPaws attendee to participate. 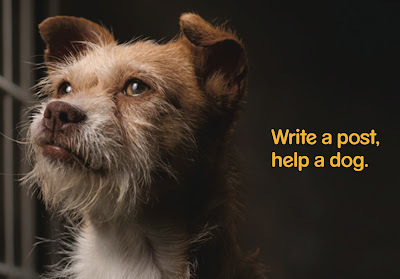 Write a post between now and September 19 about the PEDIGREE Adoption drive, created to help shine a spotlight on the plight of the 4 million dogs who end up in shelters each year. Mention that this year, the PEDIGREE Adoption Drive is helping homeless dogs by donating a bowl of food to shelter dogs for everyone who "Likes" the PEDIGREE Adoption Drive on Facebook. So far, more than 1 million bowls have been donated, and Pedigree's goal is to reach 4 million this year -- a bowl for every shelter dog. (So if you haven't already done so, "Like" Pedigree now!) And, through September 19, Pedigree will up the anty by donating an ENTIRE BAG of food for each blogger who posts about the program. I mentioned a few days ago that Cosmo and I are thrilled to be one of the 10 bloggers sponsored by Pedigree to attend BlogPaws West, this Thursday through Sunday in Denver, CO. Additionally, from Thursday, September 16 through Sunday, September 19, our team of Pedigree BlogPaws bloggers is hosting a Blog Hop to raise awareness for the "Write a Post, Help a Dog" effort. Just check back here next Thursday to add your blog to our list. We participate in a pet bloggers Blog Hop every Saturday, so you'll see some action this weekend as well. If you want to get a taste of what this all looks like check out recent Blog Hops on Two Little Cavaliers, Life With Dogs and Confessions of the Plume. And finally, to follow the fun at BlogPaws, check out @CosmoHavanese on Twitter! He'll be tweeting using the #BlogPaws hashtag, and when we're chatting about Pedigree at BlogPaws, we'll add the #dogsrule (sp) hashtag. The (sp) denotes that we are sponsored by Pedigree at BlogPaws. Im glad someone is trying to help my canine cousins! Yay! My friends at all these shelters are going to get some good food! We join paws with you in helping the homeless in shelters get full tummies while waiting FUR their FURever homes. Hi we are new followers of your blog - we found you from the pedigree blog post. انتشار الحشرات فى البيوت والمنشئات من المشكلات التى تؤرق سكون الكثير من الزبائن الكرام فكل منا يأمل فى المكث فى مقر نقي خالى من اى حشرات لهذا يتطوع الكثيرون فى مكافحة هذه الحشرات باستعمال المبيدات واليرسولات المتغايرة ولكنها فى أكثرية النتائج لا تعطى النتائج المرجوة فهى تكون باعتبار حل مؤقت يدوم لساعات بعدها يرجع الحال لما كان عليه . ولكن للدفاع عن افضل عليكم الاستعانة بمؤسسة ركن العربى مؤسسة مكافحة حشرات بحائل الحل الافضل والامثل فى ميدان مكافحة الحشرات ورش المبيدات .